Congratulations to Dr. Jarek Nieplocha on receiving the 2007 Laboratory Director's Award for Exceptional Scientific Achievement. The award recognized Nieplocha for the development of advanced programming, specifically the Global Arrays (GA) toolkit, for scientific simulations on high-performance computers. Nieplocha—nominated by Dr. Moe Khaleel, Battelle Fellow and Computational Sciences and Mathematics Division Director—has an international reputation for leading-edge computer-science research and innovative software tools that have significant impact on advancing scientific-simulation capabilities. The GA toolkit and other tools developed by Nieplocha and his team form a parallel software foundation for multiple scientific-simulation packages worldwide. GA also enables scientific discovery through advanced computing on a wide variety of comparable systems, ranging from clusters of PCs to the most powerful supercomputers. The U.S. Department of Energy's (DOE) Office of Advanced Scientific Computing Research (ASCR) advisory panel pointed to Nieplocha's GA toolkit as the most innovative programming model funded by DOE's Mathematical, Information, and Computational Sciences Program. 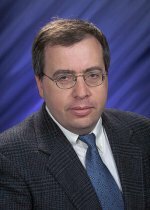 In his keynote talk at Supercomputing 2002, Dr. Ray Orbach, Director of DOE's Office of Science, named GA as one of the three most significant accomplishments in the area of computer science funded by DOE. Throughout his career, Nieplocha has been engaged in adopting emerging computer technologies to the benefit of scientific simulations. For example, he recently proposed and chaired the Workshop on Multithreaded Architectures and Applications, MTAAP'07, a successful, first-ever workshop on applications and algorithms for emerging multithreaded architectures.